Dinosaur egg hunt with these dino shaped plastic eggs. Dinosaur Candy filled Easter eggs are great for Easter baskets. 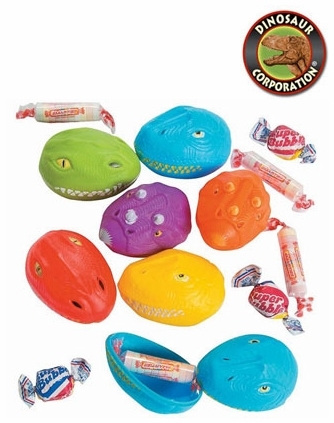 T-rex, Triceratops and Brachiosaurus Eggs are filled with Jurassic candy including Jelly Bean Werks, Smarties� and Super Bubble� Gum. * Size: 2 1/2" (6.4 cm) eggs. * Total weight approx. 2.1 oz.